African Trophy Hunting is very famous among people who loves and enjoys nature, the outdoors and adventure. Outdoorspeople who experienced the wildlife and hunting opportunities of Africa, also think that Namibia is "the best kept hunting secret" on the African continent. Maybe you are one of the people ready to indulge in your dreams of an unforgettable hunting adventure to Africa. If this will be your first hunting trip to Africa, you will certainly have a lot of questions. Hopefully you will find all these Namibia hunting FAQ answered here. 1. How do I get to Namibia? Most visitors enter Namibian grounds at Hosea Kutako International Airport in Windhoek. The airport lies about 40 kilometres from the city centre. The national airline Air Namibia flies four times a week directly from Frankfurt, Germany to Windhoek. Most other airlines - Lufthansa, SAA, KLM, Swiss, British Airways - service Windhoek via Johannesburg. You can fly from USA or any other country via Germany or South Africa to Namibia. 2. Visa and passport requirements? Citizens of the United States, as well as E.U. 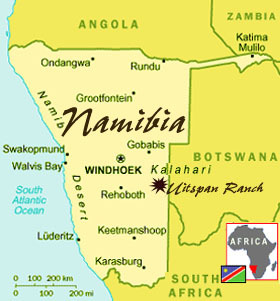 member countries (except Greece) do not require visas to visit Namibia. Namibian law requires that your passport must be valid for at least 6 months from your date of arrival. Persons traveling via South Africa must have 2 consecutive blank pages, the left and right hand page, available in their passport. 3. 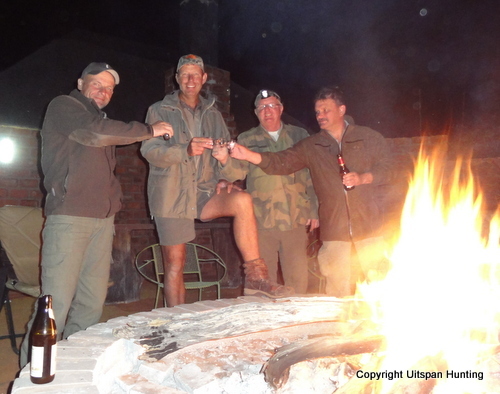 What is the location of Uitspan Hunting Ranch? Uitspan Hunting Ranch is located in the far-eastern part of Namibia next to the border of Namibia/Botswana (see marking on adjacent map). This is the heart of the Kalahari - the well-known and famous semi-desert of Southern Africa. Uitspan Ranch is a 4.5 hour drive from the international airport. 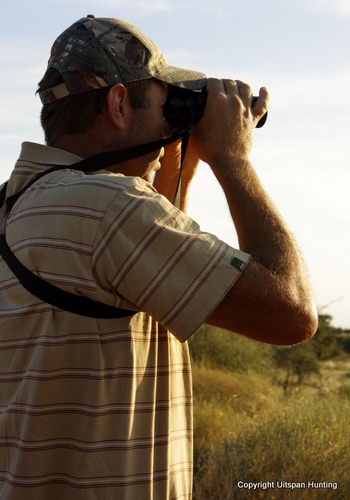 We personally pick up all our hunting clients at the airport and take them back again at the end of their safari. The drive to the Kalahari gives our visitors the opportunity to see more of the Namibian landscape and we sometimes make a half-way stop to stretch legs. On request, we also organize charter flights for our visitors. From the international airport, it is a 1.5 hour flight to the private airstrip on Uitspan Ranch. 4. What is the size of the hunting area and what species are available? Uitspan Ranch, our base here in the Kalahari, is a 7000 hectares (17 300 acres) area where we hunt on. We only have high fences on the outer borders of the ranch. Furthermore, do we also hunt on several other ranches in the Kalahari and in central Namibia, depending on the species our clients want to hunt. These areas are huge and the animals are free roaming. We hunt the Hartmanns Zebra in their natural habitat in Khomas Hochland, the mountaineous area near Windhoek. This is always a thrilling experience. Near the international airport we have another special area where we hunt especially Warthogs, but Waterbuck, Kudu, Hartebeest, Oryx and Baboon can also be found here. We start most hunts at this place because it is not a long drive for the clients to do after their long flights. The Kalahari is our prime hunting area and famous for the best quality trophies, especially on Oryx, Springbok, Eland, Impala, Kudu and Blue Gnu. We have the species like Duiker, Steenbok, Black Gnu, Giraffe, Red Hartebeest and Blesbok also available here. 5. How are hunts conducted? All hunts are conducted on foot except when a hunter is physically incapable of doing so. A good level of fitness is recommended. We use 4x4 hunting vehicles to spot animals and once the animals are spotted, the hunt proceeds on foot. Once game has been spotted, the stalk is planned, and the vehicle drives off. "Fair Chase is defined as pursuit of a free roaming animal or an enclosed roaming animal possessed of the natural behavioral inclination to escape from a hunter and be fully free to do so." Your unsurpassed satisfaction is our foremost priority. You may choose to hunt one-on-one (1x1) with your own Professional Hunter. Or you may choose to hunt alongside a friend with a Professional Hunter. We limit two hunters per Professional Hunter for the highest quality of service for your money. Except for Michael and Dawie, the two acting Professional Hunters registered for Uitspan Hunting, we have on call other free-lance Professional Hunters whom we trust. 6. Can Bow Hunters be accommodated? We are registered at Namibia's Ministry of Environment and Tourism for bow hunting and the facilities are available. Hunters often combine bow hunting with a rifle hunt. 7. What is the best time to hunt in Namibia? Namibia's trophy hunting season opens in February and runs through November. Being 10 months long, it incorporates each of the four seasons. 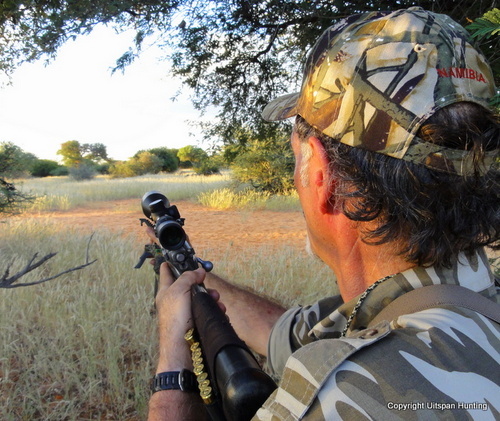 Since our climate is very hot during our summer months, we do not recommend hunting in the Kalahari during February and also October and November. There are no particular months when plains game hunting is necessarily better than other times, but time-constraints or personal considerations, such as weather, bow-hunting or specific seasonal activities might make a certain period of time more desirable to you. Keep in mind, while pondering your dates for hunting in Namibia, that seasons in Namibia, since we're are in the Southern Hemisphere, are opposite of those in the Northern Hemisphere. 8. What is the amount of time I need for my safari? There is no "typical" itinerary for hunt with us. Our terrain and our African hunting trophy species are so varied that we prefer to customize the safari to fit each individual's priorities. Once you have decided on the species you wish to hunt, we will recommend the amount of time required to meet your expectations for the variety and quality of hunting species that you desire. On average, we work on one day per animal for plains games. Bow hunting safaris are between 7 and 12 hunting days, with a minimum of 6 hunting days required for plains game hunting. 9. What shots or vaccinations do I need before I go? No specific health requirements are requested for entry into Namibia. An up-to-date tetanus shot for all travelers to Africa is recommended. Malaria is not a threat in the areas where we hunt, but it is suggested that you refer to your personal physician on this matter. Be assured that, in case of extreme medical emergency, a 24-hour medical emergency intervention and evacuation service is on call, with ICU facilities which evacuate patients by airplane, helicopter, or road. We also have a comprehensive range of medication in stock at our camp, and all hunting vehicles are equipped with First Aid Kits. It is advisable that you bring along an adequate amount of prescribed, personal medication. 10. How many guns can I bring, how do I get them to Africa, and what calibers do I need? 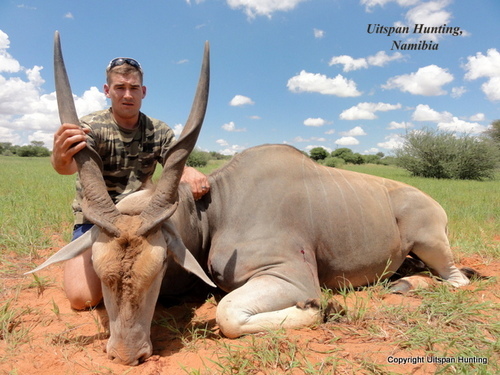 Namibia is a very hunter-friendly country and you can bring the rifles of your choice. However, you are only allowed to bring 80 rounds of ammo per rifle. You will be required to fill out a Rifle Import/Export Application, which must be handed to the police at the airport. You can click here to download and print your Rifle Import Application﻿. Have the Rifle Import Application filled out and ready when you arrive in Namibia. Rifles must be transported in its own sturdy carry case and note that the ammunition has to be transported separately in a lockable container. No pistols, revolvers, automatic or semi-automatic weapons may be imported into Namibia. If you will be travelling via South Africa, we recommend that you use a competent, experienced agent or outfitter to help with the paperwork before you leave. Please bring with you a document of ownership, stating the serial number of the firearms. This document can be obtained at your local police station. The average shooting distance while hunting with us will be between 150 to 200 yards. Any 30 cal and bigger performs very well on the game one is likely to encounter. Recommended calibers will be 30.06, .300 Win Mag, .338 Win Mag and .375 H&H. 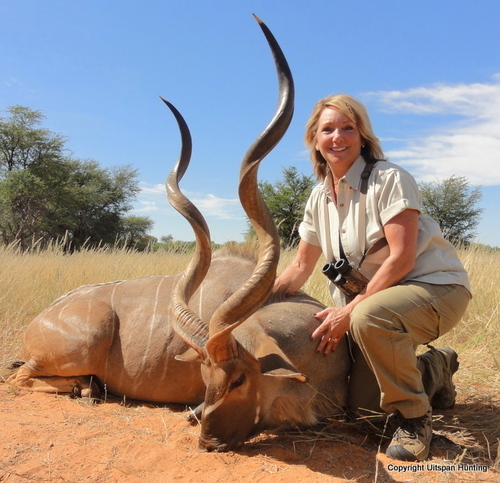 If you have an Eland on your wish list, we recommend a .338 or .375 rifle. African game is known to be very cautious, but we guide our clients in such a way to make sure they get in the best possible shooting position. Small branches and foliage may present some challenge, which is why we recommend using a heavier bullet. We recommend at least 180gr of premium core bonded bullets. Read also this article on ammo and rifles for hunting in Africa. The caliber you are using is of great importance, but also a personal matter. It is just as important that you are comfortable and familiar with your rifle, as it is that you have an adequate caliber. For plains game, bring your favorite deer rifle. .270 to a .300 magnum will be perfect. Bring a rifle that you are comfortable shooting, that you can shoot well. As with all hunting, shot placement is more important than a large caliber. Feel free to contact us regarding your hunt and your rifle to assure yourself that you have an adequate caliber. For dangerous game, contact us for minimum caliber requirements. For your convenience, we've created a downloadable Africa hunting packlist that you can print out. These are our recommendations, but feel free to use your own discretion. 12. Info on Uitspan Accommodation facilities? We have two ranch houses on Uitspan as well as a "hunters' camp" where we accommodate our hunting guests. While being in the middle of the African bush, these facilities still offers all the requirements to make your stay easy and comfortable. The buildings were planned in such a way that it will enhance your safari travel experience, because you will feel very much part of nature. We have 5 rooms available in the camp which have cold/hot showers, flushing toilets, bedding and closets. We personally service the rooms every day and make sure your laundry is done at least every second day. We have internet and phone facilities availbable at Uitspan's two main ranch houses where you will at least come by once a day. No running electricity is available in our hunters' camp. Solar power is used for lights and the charging of camera batteries, etc. We preferably accommodate only 4 hunters (2x1) with 3 or 4 observers at a time.We prefer not to take more than that at any stage to make sure we give each client the best hunting experience possible. See pictures of our accommodation facilities on Kalahari Accommodation. 13. What is the food like? Your appetite will be well taken care of on your safari holiday with wholesome traditional cuisine. Dinner is our main meal and we prepare the best meat of the game that our hunters harvest. You will likely have game meat or beef every night for dinner. Breakfast is usually a light meal at ±6am with cereal and/or "rusks" with milk, juice and coffee or tea.We provide a complete sit-down meal at ± 11am with eggs, bacon, sausages, fresh bread, etc. The most important thing to remember about eating in Africa is to disclose any strong food preferences, dislikes or allergies ahead of time. We really want you to have the time of your life so if you are allergic to something or absolutely hate something please let us know via the Questionnaire we will send to you some time before your safari. 14. Can my non-hunting spouse go? A non-hunting friend or spouse is welcome. They may join the hunters on the hunt or enjoy activities such as photography, hiking, bird watching or just relax at any one of our ranch houses during the day when the hunters are in the hunting field. Every evening before dinner, we all join together around the campfire to share the day's stories and experiences. Read about Terri's (a non-hunting spouse) hunting experience. 15. Trophy preparation and Taxidermy? For many people, African trophy hunting is an once-in-a-lifetime opportunity. After such a safari the trophies taken are the proof and product of all the excitement and wonderful times and will be shared with friends many, many years later. We appreciate this and therefore it is of the utmost importance to us that the greatest care is taken in the skinning and preparation of your trophy to ensure that you receive the best possible article back home. We also put a label on every part of your trophy. A taxidermist will do the final cleaning and dressing of the trophies and ship it out to you at your cost. It is possible to have your trophies finished and mounted in Namibia and then shipped out. It is usually cheaper that way. You can however discuss it with the taxidermist and decide which way you want to do it. Payment of taxidermy fees is usually due when the trophies are finished - before shipment. It takes approximately 8-10 months. A deposit is required by the taxidermist. 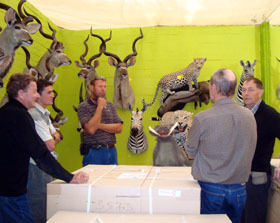 We recommend the services of any of two very professional taxidermists in Namibia. For prices and more info you can contact Wilco or Loide at Reiser Taxidermist or contact Louw at Trophaendienste via e-mail. 16. Do I need insurance to go on an Africa hunting safari? We as Uitspan Hunting take every reasonable precaution to ensure the safety, well-being, and satisfaction of our clients. We maintain the insurance policies that are required under Namibian Law. However, as everyone is well-aware, international travel and safaris carry a certain amount of inherent and unavoidable risk and danger. Therefore, we cannot, and do not, accept liability for accidents, personal injury, illness, travel delays, and damage to, or any type of loss (including theft), of clients' personal property, such as firearms, camera equipment and luggage. Accordingly, we require that all clients arrange for their own travel, life, medical, and cancellation insurance to cover all these potential risks that would occur before, during, or after their safari. This coverage can easily be obtained through reputable and experienced international travel agents. We respect the privacy of our clients and therefore we can not display their e-mail addresses on our website. We do not want them to be victims of spam! For a list of our references, please fill in this little form. You will then receive an address-list of our References whom you may contact about hunting on and visiting Uitspan Ranch, Namibia. Please send me a list of References. The Kalahari has magnificent animals of which outstanding trophies exist. You may want a trophy like this as a token of your unforgetable African Trophy Hunting adventure in the Kalahari of Namibia.